Google Scholar is absolutely one of the best academic search engines out there. It allows you to easily search for and access academic papers and journal articles related to your topic of interest. 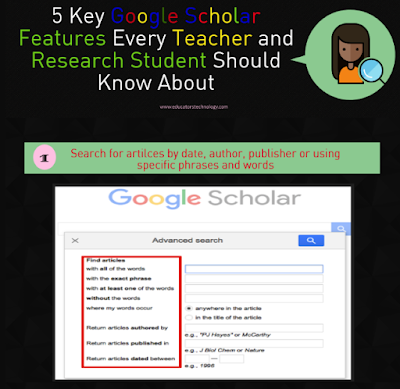 Besides the search functionality, Scholar also provides you with a host of other interesting features to help you in your research jounrey. These include: a virtual space (your own library) where you can save and organize your articles, the ability to import citations to the bibliography manager of your choice, email alerts to help you keep updated about the recent publications in your topic area and many more. In today's post, we have particulalry highlighted five key features we believe every teacher or research student using Google Scholar should know about. Check them out below and as always share with us your feedback. This post is also availabe as a free download infographic from this page. The advanced search functionality (accessbile from the dropdown menu in the left side bar) allows you to refine your search queries and get precise results. It features several critteria to help you narrow down the scope of your search. For instance, you can search articles by a particular author, journal, and/or publishing date. You can also search for articles that contain (or doesn’t) specific words and phrases. Google Scholar allows you to search for artices written in a specific language. By default, Scholar returns results of search pages written in any language. You can change this from the Settings page located in the left sidebar. Go to Settings, click on Languages, and check the box next to ’Search only for pages written in these language(s)’, then hit Save. If you are studying or working in an educational instution, you can link the library of your institution to your Google Scholar account and each time you search for an article, Scholar will show you whether returned search results have library access links or not. You can connect the bibliography manager of your choice to Google Scholar and start getting search results with links to important citations to your bibliography manager. The ones that are supported now are: BibTex, EndNote, RefMan, and RefWorks. Here is how to connect it: Go to settings, click on Search results, and check the box next to ‘Show links to import citations int’. Email alerts allow you to stay updated about the recent publications on a given topic. For instance, you can create an email alert for the topic ‘digital literacies’ and each time an article is published on this topic you will get a notification in your inbox with the link to the new article. You can also create email alerts for your favourite authors and scholars and start receiving emails with their latest updates. here is how to create an alert: from the search page in Google Scholar, click on ‘Create alert’ in the left hand side, type in your alert query and your email and click on ‘create alert’.